It will not have escaped the notice of British readers of this blog (about half the total) that it is still raining; and if you’ve looked at a long-range weather forecast with a sense of mild desperation, that it will continue raining for the rest of May. The only possible reaction is to curl up under a blanket or duvet with a book or several. 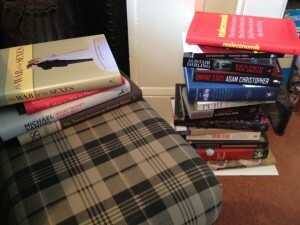 Luckily, my ‘just read’ pile of books is outweighed by the ‘in pile’. There’s plenty in the weekend papers, too. The new British Library exhibition on landscape and British literature looks very enticing, and is featured in the Guardian Review. 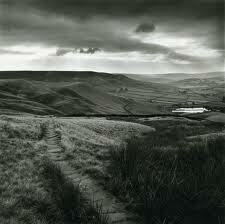 The illustration is from Remains of Elmet by Ted Hughes and photographer Faye Godwin. It’s one of my favourite landscape books, not least because I’m from more or less that part of the world, the Pennines in between Lancashire and Yorkshire, & find it so evocative of my childhood wandering around the moors. The feature also mentions a terrific book I reviewed here, Edgelands, by Michael Symmons Roberts and Paul Farley. Ferdinand Mount’s The New Few: Or A Very British Oligarchy also looks like an excellent, angry-making book about the way a business elite has creamed off for itself so much of the productivity growth of the past couple of decades via their bonus scam. Thank goodness it seems to be the beginning of the end for that. The Telegraph has an article on the woman behind the institutional investors’ revolt, Michelle Edkins of Black Rock.